'Fats' Bannerman is enjoying success as the writer and presenter of Thus Engaged, a romantic radio serial about the lives and loves of a Regency heroine. But when grim reality violently intrudes into Fats's life, his frail fantasies become unbalanced and his ability to separate fact from fiction breaks down, with devastating consequences. 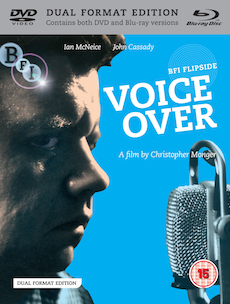 Featuring a compelling central performance from the great British screen actor Ian McNeice, this controversial film from award-winning Hollywood director Christopher Monger caused a sensation upon its original release. BFI Flipside is dedicated to rediscovering the margins of British film, reclaiming a space for forgotten movies and filmmakers who would otherwise be in danger of disappearing from our screens forever. It is a home for UK cinematic oddities, offering everything from exploitation documentaries to B-movies, countercultural curios and obscure classics, If it's weird, British and forgotten, then it's Flipside. Browse more BFI Flipside titles. Fully illustrated booklet with newly commissioned essays, biographies, original promotional materials, and recollections by Christopher Monger and Ian McNeice.